The preacher might compare the way the Annunciation is treated in Jesus films, such as Jesus of Nazareth or The Jesus Film (1979). Ed McNulty, Visual Parables. Preaching This Week commentary , WorkingPreacher.org, Luther Seminary, 2011. 2008. Commentary and Spiritual Perspectives, Advent 4B, 2014. Commentary, historical background, poems and readings. Center for Liturgy, St Louis University. Español. "Here I Am," Kathryn Matthews Huey, Sermon Seeds, SAMUEL, UCC, 2014. "The God of Impossible Pregnancies," D. Mark Davis, Left Behind and Loving It, 2014. 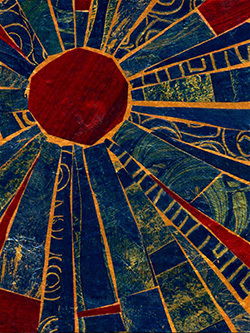 Disclosing New Worlds, Advent 4B, commentary and reflections, Lawrence Moore, 2014. Adventurous Lectionary, Bruce Epperly, Living a Holy Adventure, 2017. Ministry Matters, December 21, 2014. Process and Faith Lectionary Commentary, Advent 4B, 2011, Bruce G. Epperly, "...bringing process-relational thought to people of faith." Advent 4B, The African American Lectionary, 2011. Girardian Reflections on the Lectionary, Advent 4, by Paul Nuechterlein & Friends. Jesus Now, Advent 4B, lectionary, study and worship resources from Faith Futures Jesus Then & Now. Rumors, for December 21, 2008, Ralph Milton, "Sermon helps for preachers with a sense of humor." "Mary's Response," Karoline Lewis, Dear Working Preacher, 2017. "The Politics of Divine Disruption," Fritz Wendt, Political Theology Today, 2017. "The Hope That Lives," Jan Richardson, The Advent Door, 2017. "When the Lord Is With You," Michael Ruffin,Connections, 2017. "Everyday Annunciations," Chana Tetzlaff, Modern Metanoia, 2017. "Who? Me?" Glenn Monson, Law & Gospel Everywhere, 2017. "Mary's Song and the Tax Plan," Melissa Bane Sevier, Contemplative Viewfinder, 2017. "The Words of Angels," Nancy Rockwell, The Bite in the Apple, 2017. "Poetry from Prison: Lifting Up the Lowly," Liz Milner, 2017. "Living the Peace," Andrew Prior, 2017. "Blessed Like Mary," David Lose, Dear Partner in Preaching, 2014. "The Pause Before Yes," Debie Thomas, Journey with Jesus, 2014. 2008 by novelist Ron Hansen. "Whose House?" commentary and discussion, RevGalBlogPals, 2014. Advent as a Way of Life, Karoline Lewis, Working Preacher, 2014. "Control is such an alluring illusion," Bob Stuhlmann, Stories from a Priestly Life, 2014. "Stewards of Advent Time: Be," Sharron R. Blezard, Stewardship of Life, 2014. 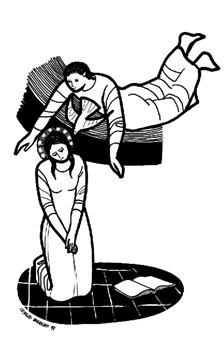 "The Annunciation: a theological insight into God's life with us," Peter Lockhart, A Different Heresy, 2014. "Found Favor?" Thomas Beam, 2014. "Behold the Moment," Andrew Prior, A Poetic Kind of Place, 2014. "'Do Not Be Afraid,'" Janet H. Hunt, Dancing with the Word, 2014. "Gabriel and Mary," Jan Richardson, The Advent Door, 2014. . Use of images. "Mary, Actualized, Mature, and with Agency," Lia Scholl, Question the Text, 2014. "Missing the Magnificat Point," Lynn Miller, Art & Faith Matters, celebrating our creative and living God by generating art and architecture resources for congregations and individuals. Art and Faith Matters facebook page contains additional resources. "Expecting a Divine Visitation," Bob Cornwall, Ponderings on a Faith Journey, 2014. "Find in Us A Mansion," Suzanne Guthrie, 2014. "Peace on Earth," Steve Goodier, Life Support System, 2014. "Nothing Is Too Wonderful to Be True," guest essay by Ron Hansen (Exiles, A Wild Surge of Guilty Passion) The Journey with Jesus: Notes to Myself, Daniel B. Clendenin, Journey with Jesus Foundation, 2011. Magnificat for a Broken World, Carolyn Sharp, Odyssey Networks ON Scripture, 2011. "And It Was Sufficient," Kyle Childress, The Ekklesia Project, 2011. "Gutsy Faith, Greater than the Angels," Rick Morley, 2011. "Favored Ones," David Lose, Dear Working Preacher, 2011. "The Myth of the Extraordinary," John van de Laar, Sacredise, 2011. "Just say, 'Yes. Let it be...'" Peter Woods, I Am Listening, 2011. Advent 4: An Awful and Wondrous Yes, Jan Richardson, The Advent Door, 2011. Use of images. "Life beyond the Usual," Sharron R. Blezard, Stewardship of Life, ELCA, 2011. Pastoral devotions for Advent 4 Stephen P. McCutchan SermonStudio. "Confused and Disturbed," Neil Chappell, a weird thing, 2011. "Impossible Reality," Miriam's Tambourine, Memphis Theological Seminary, 2011. "Hail Mary, Full of Grace," "Let It Be," Carl Gregg, Patheos, 2011. "The God-Bearer: Advent Reflections on Mary," Jenny Warner, Patheos, 2011. "A Mother's Wisdom," Alyce M. McKenzie, Edgy Exegesis, Patheos, 2011. "Waiting Together," David Henson, Patheos, 2011. "Mary's Miracle" Caspar Green, Scarlet Letter Bible, 2011. "Meeting God on the Road," Bob Cornwall, Ponderings on a Faith Journey, 2011. "Dwelling Places," Melissa Bane Sevier, Contemplative Viewfinder, 2011. Sermon Notes for December 18, Michael Rich, In-Formatio, 2011. "Lingers in the Shadows," Larry Patten, 2011. Dylan's Lectionary Blog, Advent 4B. Biblical Scholar Sarah Dylan Breuer looks at readings for the coming Sunday in the lectionary of the Episcopal Church, 2005. "Open Paths," Kathleen Norris, 2005. "Mary Says Yes," John Stendahl, 2002. "God's Entrance," Fleming Rutledge, 1999. "Representatives and Partners," Delores S. Williams, 1990. "Where Is God's Waiting Place?" Enuma Okoro, "Bearing the 'Wait' of the World," 2011. "A Summons and Sending," Michaela Bruzzese, "Christmas Presence," 2008. "Lifting the Lowly," Robert Roth, "The Beauty of Justice," 2005. "Awake to Grace," by Carla Pratt Keyes. A Sermon for Every Sunday. Video sermons from America’s best preachers for every Sunday of the Liturgical Year. "Here Am I," by MaryAnn McKibben Dana. A Sermon for Every Sunday. Video sermons from America’s best preachers for every Sunday of the Liturgical Year. "The Reality of Christmas," the Rev. Pendleton Peery, Day 1, 2014. "Gabriel," Frederick Buechner Sermon Illustrations. "Call and Response," the Rev. Dr. Kenneth Carter, Day 1, 2011. Selected Sermon, Advent 4B (RCL), the Rev. Canon Frank Logue, in Worship that Works, ECUSA, 2011. "It's Not about Mary," the Rev. Dr. Fred R. Anderson, Day 1, 2008. Points for Teaching and Preaching, The Lectionary Lab, 2014. 2011. 2011,. "Here I Am," Weekly Seeds, UCC, 2017. "An Attitude of Discipleship: Trusting,"John and Robin McCullough-Bade, Daily Discipleship Bible Study, Evangelical Lutheran Church in America, 2008. Lesson Plans That Work, Adults, Advent, Year B, The Episcopal Church, 2008. Bible Study - Advent 4B - verse by verse Roman Catholic lectionary commentary at St Charles Borromeo Catholic Church, Picayune, MS.
Mustard Seeds, "Love/Saying Yes to God," Advent 4, 2014. A lectionary-based ideas resource for leaders of contemporary worship, Ann Scull, Gippsland, Australia. LCA Worship Planning Page, Advent 4B, 2014, "Everything lay-readers need to prepare worship"
Lectionary Liturgies, Advent 4, Thom M. Shuman, Presbyterian Church (U.S.A.), 2014. Worship and Liturgy Resources, Advent 4 by Rev David Beswick, Uniting Church in Australia. Lector's Notes, Advent 4, Gregory Warnusz, Saint Jerome Parish, Bellefontaine Neighbors, MO. Notes and commentary for those reading this week's lectionary texts to the congregation. Call to Worship, December 18, 2011, Mary Jane Konings, Timaru, New Zealand. Prayers of the People, Advent 4B, Rick Morley, 2011. Prayer for Advent 4B, Rev Gal Blog Pals, 2011. Reflections on collect prayers, Advent 4, Bosco Peters, Liturgy: Worship that Works - Spirituality that Connects. HermanoLeón Clipart, Advent 4, Free clipart, backgrounds, slides, etc. Clip Art Images: Luke 1:26-38, Misioneros Del Sagrado Corazón en el Perú. Advent 4B at Cerezo Barredo's weekly gospel illustration. Follows Latin American Roman Catholic gospel reading, though most gospels texts/themes are found in the index. Liberation emphasis. Clip Art, Advent B4, Fr. Richard Lonsdale, Resources for Catholic Educators. God in a Box, Faith Element, 2011. "God Came for Justice," FaithElement discipleship system "setting the Bible free," 2014. “There's Not a Thing That God Can't Do,” an original hymn by Carolyn Winfrey Gillette, celebrates God’s call and miraculous blessing of Mary and of people today. This hymn was commissioned by The Presbyterian Outlook magazine for new Advent hymns to Christmas carol tunes. Tune: WINCHESTER OLD 8.6.8.6 (“While Shepherds Watch Their Flocks”). “I Believe (The Apostles' Creed),” an original hymn by Carolyn Winfrey Gillette, celebrates the Apostles' Creed and includes this verse: "Jesus, by God's Holy Spirit, was so wondrously conceived, Born unto the Virgin Mary, who your promises believed." Tune: AUSTRIAN HYMN 8.7.8.7 D (“Glorious Things of Thee Are Spoken”). "Indescribable Gift," "Steadfast Love,"Brenton Prigge, NewHymn. Hymns of the Spirit Three, Advent 4B, Richard E. Hurst, Universalist National Memorial Church. Hymn and Song Suggestions, Adven4B, 2017, annotated suggestions from Natalie Sims, Singing from the Lectionary. Shepherd Sounds, Advent 4B, Background information for hymns and choral music following the lectionary from the Episcopal Church of the Good Shepherd, Austin, Texas, by Eric Mellenbruch and David Zersen. Lectionary Hymns, Advent 4B, National Association of Pastoral Musicians. Choral Anthem Project, Advent 4B, National Association of Pastoral Musicians. Sing for Joy, Advent 4B, 2008. Choral reflections on this week's lectionary readings, St. Olaf College. Starters for Sunday, 18 December, 2011. Thoughts on Readings, Prayers & Hymn Suggestions. Office for Worship, Doctrine and Artistic Matters, Church of Scotland. Together to Celebrate, December 18, 2011, David MacGregor, Uniting Church in Australia. Contemporary Christian Music resources. "Grow Snake," John Stevens, Dollar Store Children's Sermons, Video, 2014. "Angels," Dianne Deming, Children's Sermons Today, 2011. Lesson Plans That Work, Younger Children & Older Children, Advent, Year B, The Episcopal Church, 2008. "Stirrings," based on Luke 1:39-45 (46-55), Jim Hatherly.